We know there are so many food options at the new lifestyle mall, Sky Avenue in Genting Highlands including restaurants, cafes, fast food chains, and a Malaysian favourite food court. Despite of being there for so msny rounds, there are still plenty of new eateries for me to explore. which are ideal for dinners be it with family or friends..
We don't usually see alot of homey Vietnamese cuisine in Malaysia, but if you are craving for some authentic flavours, then Royale Vietnam is the right place to visit. From the restaurant decors to the waitstaffs' attire and dish presentation, everything is just so Vietnamese! Whether you come with your partner or a big group of people, there are always plenty of menu options for you as most of the dishes here are meant for sharing. We opt for 4 ala carte dishes which ideally serve 2-3 pax. The star of the evening is the piping hot, slow-braised traditional Vietnamese caramelized pork belly and boiled eggs served in a claypot with fire underneath. The pork belly is extremely tender and falls off the bone, whereas the fatty layer melts perfectly in the mouth. Interestingly, the savoury-sweet sauce is cooked with coconut juice that does the "magic" to the overall flavours. It is a great dipping sauce for cucumbers, lettuce and other fresh vegetables. Best served with white rice. To complement with the meaty dishes, we have a refreshing bowl of pomelo salad that gives a nice spicy kick to the palate along with the dried calamari, as well as the Vietnamese No.1 famous spring rolls that wrap around lots of greens. Another restaurant that is worth visiting is the Thai famous boat noodle which serves authentic Thai-style rice noodles in petite portion and we all love competing on how many bowls we can finish per meal! The rice noodles are available in 6 types: Beef and Chicken flavours (Pathumthani / Ayutthaya / Prosperity Yum flavours). The spicy one is really fiery hot yet it gets us hooked and craving for more. If you don't like your noodles to be too plain, you can always add toppings such as Fried Wantan Skin and Fried Chicken Skin. While we cool ourselves down with the signature Cha Yen (Thai milk tea), we also indulge into the Hot Steamy Sangkaya that features soft pillowy bread and homemade kaya that satiate our sweet cravings. I believe Sushi Zanmai is no stranger to all of us. It is good to see it opening in Sky Avenue, hence we can have an affordable option when we are craving for Japanese food. But be warned, the queue here is equally long like those outlets in Klang Valley. Feel free to read my full review of Sushi Zanmai, Sky Avenue: HERE. Calling for all rib lovers! 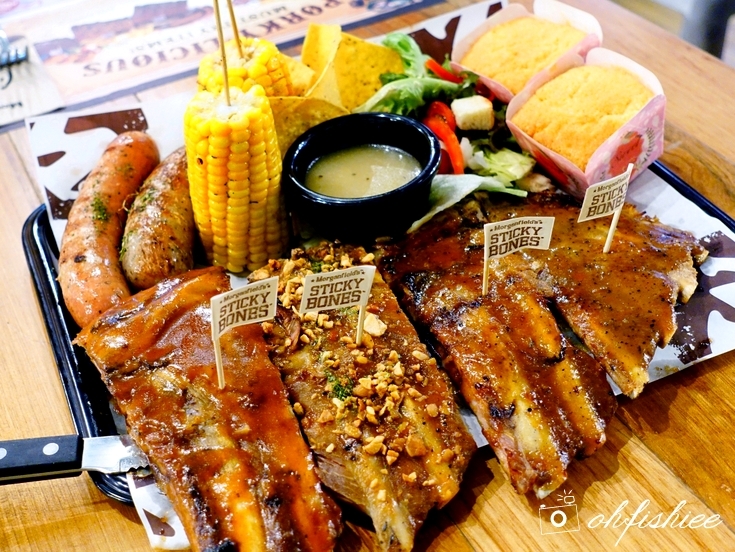 Morganfield's has, by far, the best spare ribs I have ever tried. In fact, all the 4 signature spare ribs namely the Hickory BBQ, Garlicky BBQ, Smoked Peppercorn and the Naughty Spare Ribs flavours are equally yummy in their own distinctive flavours. I love how the meat is extremely tender and falls off its bone so easily. To balance up the meaty portion, we prefer having a sharing platter that comes with the grilled Spicy Devil sausage, Herby Hog sausage, garden salad, grilled corn on cob, corn bread and crispy French Fries. *Please note that the portion served is specially prepared for 2 pax. 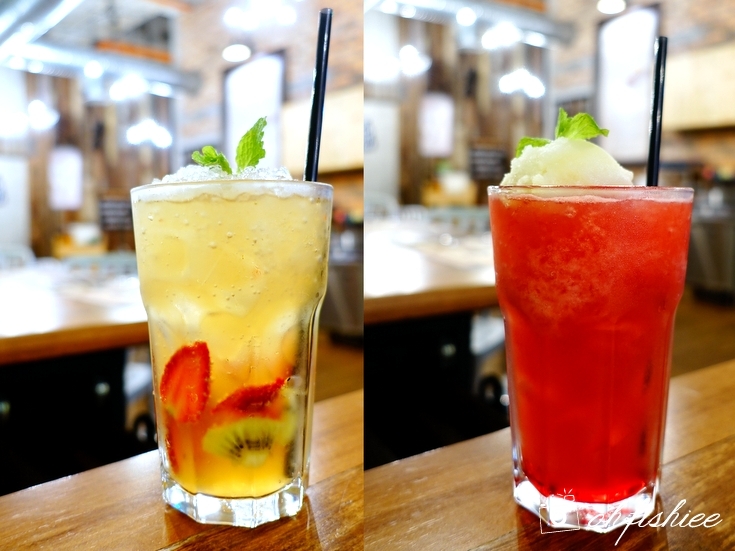 especially the fruity concoctions that give a refreshing sensation to the palate! For the health conscious or vegetarians, don't worry, you can head to BMS Organics, the popular local organic vegetarian cafe for a wholesome, healthy meal. For instance, the nasi lemak here is made of healthy brown rice, acar, beancurd and papadom. Totally meatless and organic, yet flavourful and taste great. Who doesn't love superheroes? 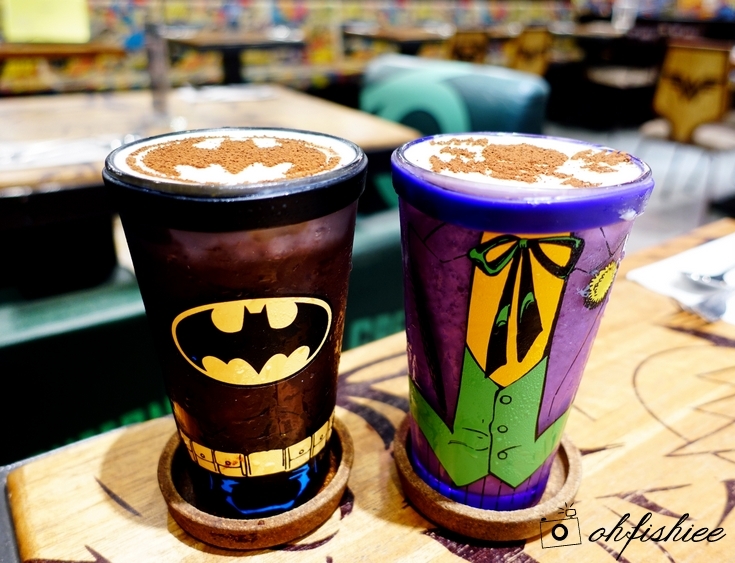 I don't mind coming back to this cafe again for the superhero-themed food such as the Flash's Backlash Sausage roll served in a cool Superman box and the Gotham's City Chocolate Milkshake with a Batman coffee art on it. How cool is the food right! It is my second time here, and this round we are sampling the Katana Sliced Hawaiian Pizza which is adorned with a cute "bat" pastry on top. Same goes to the Mera's Ocean Magic Seafood Spaghetti. Overall, the food presentation is amazing and definitely Instagram-worthy! 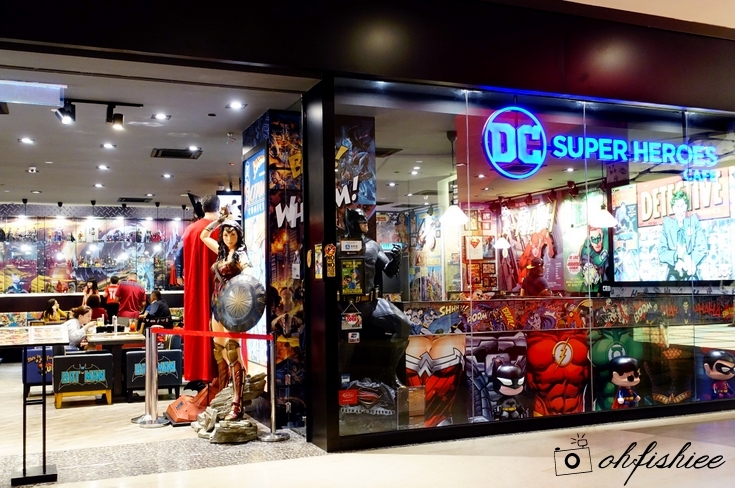 Feel free to bring your children here to enjoy the excitement of fantasy or relive your childhood moments here. Read my full review of this cafe: HERE. 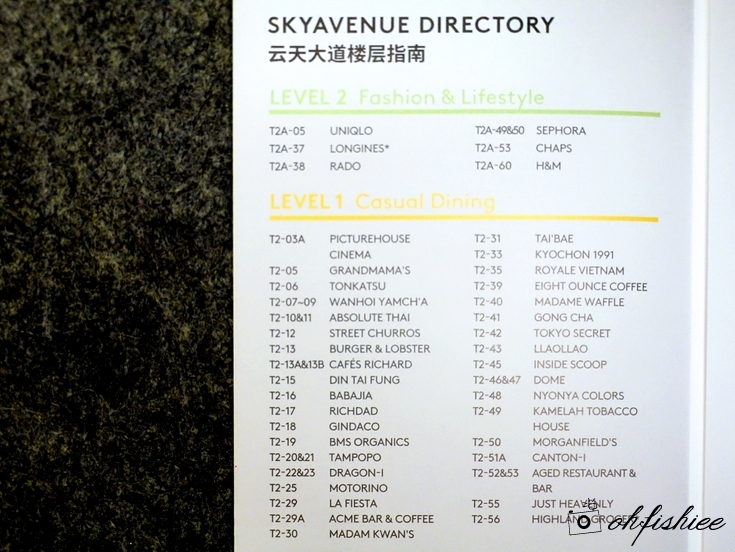 So...feel free to explore Sky Avenue yourself and tell me where do you prefer for dinners!